If you are having builders, joiners, decorators or any other contractors in and are concerned about the mess that will follow on from the work they are doing, there’s no need to panic. Our cleaning company provides a very efficient and reliable after builders cleaning service which is guaranteed to get your home, your office or your unit back up to habitable standard and more. 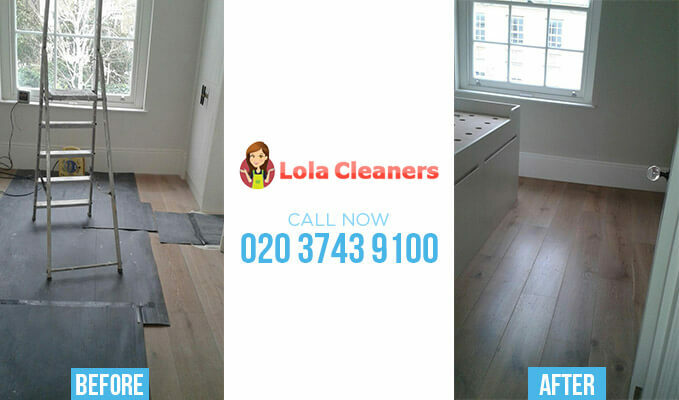 Lola Cleaners has the experience and the skillset on offer courtesy of our hardworking cleaners to deal with all the perils of builders’ mess and if you would like to book our cleaning staff contact us now on 020 3743 9100. Building works tend to leave a bit of a strange smell and there always seems to be loads of dust blasted around the room when you are having works done. Builders dust can be bad for your health, particularly if you have asthma and allergy problems and it has a knack of getting everywhere! Customers tell us about dust accumulating on the tops of books, on door frames, along the tops of radiators and inside ornamental vases and candle holders. This requires nothing other than very intense and thorough after builders cleaning and many people want to seek the help of professional cleaning agencies. Our cleaning company delivers a very high standard of cleaning that is as thorough and detailed as you could hope for. Our after builders cleaners have the cloths, solutions and techniques to clean a full range of different surfaces to get rid of dust, marks, footprints, stains and debris in any form. If you could do with a cleaning company that can offer a full range of cleaning services and techniques you are looking in the right place – call us on 020 3743 9100 and we will tell you exactly what our cleaners can offer you. We deal with the full range of possible post builders cleaning duties which includes, but is not limited to, scrubbing stickers away from new appliances, removal of plaster that has been improperly applied to the walls, paint that has splashed onto the floor or worse still, the carpet, and any debris or dirt that has become better connected to your floors. Our after builders cleaners are able to offer all of these tasks and more and we are careful to make sure that in every room we clean, the skirting boards are properly dusted, all the furniture polished, the fabrics checked for stains with stain removal enacted where applicable, and all surfaces scrubbed down. After we’ve completed our after builders cleaning service you’ll find that your home is better than brand new and as fresh as a daisy. Lola Cleaners demands high quality work from all its cleaners and we won’t disappoint you. Our company has the experience and flexibility to perform good quality cleaning services for a full range of customers and we are able to deal with almost any cleaning job connected with post builders cleaning. If you call us today on 020 3743 9100 we will gladly provide you with a free quote. Our after builders cleaning prices are amongst the very cheapest in the area and we charge a set fee that includes materials, workers and travel to your premises. If you would like us to calculate a free quote over the phone, on a no-obligation basis, then simply call us today on 020 3743 9100 and we will provide you with full details. We are available on every single day of the week and our flexible work pattern will enable us to get to you at any time of day that you need our help.